What happens when a school is rated as 'Requires Improvement' by Ofsted? Results of the Ofsted inspection were published yesterday. St Joseph's Catholic Academy in Hebburn has been handed a Requires Improvement rating by education watchdogs at its most recent inspection. The school's latest Ofsted report was published yesterday, ruling that standards have slipped since its last inspection in the spring of 2015. Then, St Joseph's was awarded a Good rating. This was the school's first full Oftsed inspection following its inception as an academy in July 2013. Previously, it was known as St Joseph's RC Voluntary Aided Comprehensive School. This most recent inspection was undertaken by Ofsted over two days January this year, with the report revealing that the school was given the second-lowest rating across four of five inspection areas. St Joseph's was awarded Good for 16 to 19 study programme and in the report, the leadership of the school's sixth form was praised as "strong". The school was also commended for having a "committed and motivated staff" and for having effective leadership and support in place for children with special educational needs and disabilities. We have taken a look at how Ofsted inspections are carried out and what happens after the results are published. 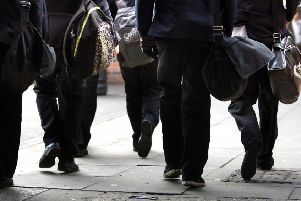 According to information on the Government's website, inspections can take place at any point after the end of the first five working school days in the autumn term. A school can submit a request for an inspection to be cancelled, but these are only granted in exceptional circumstances. All news schools, including academies, are usually inspected by Ofsted in the first three years after they open. Schools are usually notified of forthcoming inspections at around midday on the working day before the inspection date. What are the Ofsted ratings? There are four Ofsted ratings: Outstanding, Good, Requires Improvement and Inadequate. What happens when a school is rated as Requires Improvement? The school will usually have a full re-inspection within 30 months of the school's last full inspection. Those judged as Requires Improvement may be monitored by Ofsted, though this does not normally apply to a school handed the rating for the first time. The report on St Joseph's states that the school needs to "improve the quality of teaching, learning and assessment in key stages 3 and 4" and "develop the effectiveness of leadership and management". For more information, visit the Ofsted website.